Fort Yukon ( Gwich'in: Gwich'yaa Zhee, translation: "House on the Flats")   is a city in the Yukon-Koyukuk Census Area in the U.S. state of Alaska. The population, predominately Gwich'in Alaska Natives, was 583 at the 2010 census, down from 595 in 2000. This area north of the Arctic Circle was occupied for thousands of years by cultures of indigenous people and in historic times by the Gwich’in people. What became the village of Fort Yukon developed from a trading post, Fort Yukon, established by Alexander Hunter Murray of the Hudson's Bay Company, on 25 June 1847. Murray drew numerous sketches of fur trade posts and of people and wrote the Journal of the Yukon, 1847–48, which gave valuable insight into the culture of the Gwich’in at the time. While the post was in Russian America, the Hudson's Bay Company continued to trade there until the American traders expelled it in 1869, following the Alaska Purchase when the Alaska Commercial Company took over the post. During the Klondike Gold Rush, in the winter of 1897–1898, Fort Yukon received two hundred prospectors from Dawson City, which was short of supply. A post office was established on July 12, 1898 with John Hawksly as its first postmaster. The settlement suffered over the following decades as a result of several infectious disease epidemics and a 1949 flood. During the 1950s, the United States Air Force established a base and radar station at Fort Yukon; the town was officially incorporated in 1959. Since the late 20th century, due in part to its extreme northerly location and its proximity to Fairbanks, it has become a minor tourist destination. Fort Yukon village street on the Winter Solstice, before sunrise at 11:30 am. Fort Yukon is located at 66°34′2″N 145°15′23″W﻿ / ﻿66.56722°N 145.25639°W﻿ / 66.56722; -145.25639 (66.567586, -145.256327). Fort Yukon is located on the north bank of the Yukon River at its junction with the Porcupine River, about 145 miles (233 km) northeast of Fairbanks. 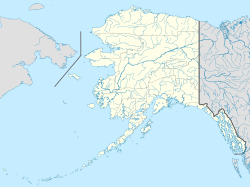 According to the United States Census Bureau, the city in Northeastern Alaska has a total area of 7.4 square miles (19 km2), of which, 7.0 square miles (18 km2) of it is land and 0.4 square miles (1.0 km2) of it (5.65%) is water. It is located 8 miles (13 km) north of the Arctic Circle, at the confluence of the Yukon and Porcupine Rivers and in the middle of the Yukon Flats. The highest temperature ever recorded in Alaska occurred in Fort Yukon on June 27, 1915, when it reached 100 °F or 37.8 °C. 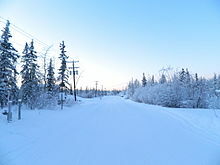 Until 1971, Fort Yukon also held the all-time lowest temperature record at −78 °F or −61.1 °C, and it still holds the record for the lowest mean monthly temperature when the notoriously cold month of December 1917 had an average daily temperature of −48.3 °F or −44.6 °C and the minimum averaged −58 °F or −50 °C. The climate regime is a strong continental subarctic climate with severe winters, being less influenced by chinook winds than areas to the west – the winter season absolute maximum being 17 °F or 9.4 °C colder than in Fairbanks. Summer temperatures are exceptionally high for such a northerly area, being far warmer than the tree line threshold. In the Summer Fort Yukon has midnight sun and in December there is no sun at all. 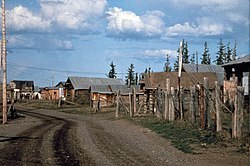 Fort Yukon first appeared on the 1880 U.S. Census as an unincorporated village of 109 residents. Of those, 107 were members of the Tinneh Tribe and 2 were Whites. It did not appear on the 1890 census, but has returned in every successive census since 1900. It formally incorporated in 1959, the year Alaska became a state. As of the census  of 2000, there were 595 people, 225 households, and 137 families residing in the city. The population density was 85.0 people per square mile (32.8/km²). There were 317 housing units at an average density of 45.3 per square mile (17.5/km²). The racial makeup of the city was 86.05% Native American, 10.76% White, 0.17% Black or African American, 0.17% Asian, and 0.17% from other races, and 2.69% from two or more races. Hispanic or Latino of any race were 1.34% of the population. There were 225 households out of which 36.0% had children under the age of 18 living with them, 25.8% were married couples living together, 23.1% had a female householder with no husband present, and 39.1% were non-families. 34.2% of all households were made up of individuals and 5.8% had someone living alone who was 65 years of age or older. The average household size was 2.62 and the average family size was 3.37. In the city, the population was spread out with 33.4% under the age of 18, 10.3% from 18 to 24, 27.4% from 25 to 44, 22.0% from 45 to 64, and 6.9% who were 65 years of age or older. The median age was 32 years. For every 100 females, there were 112.5 males. For every 100 females age 18 and over, there were 111.8 males. The median income for a household in the city was $29,375, and the median income for a family was $32,083. Males had a median income of $25,000 versus $27,813 for females. The per capita income for the city was $13,360. About 18.0% of families and 18.5% of the population were below the poverty line, including 14.3% of those under age 18 and 3.5% of those age 65 or over. ^ 1996 Alaska Municipal Officials Directory. Juneau: Alaska Municipal League/ Alaska Department of Community and Regional Affairs. January 1996. p. 57. ^ "2016 U.S. Gazetteer Files". United States Census Bureau. Archived from the original on 2017-09-03. Retrieved Jun 22, 2017. ^ "Alaska Native Place Names - Alaska Native Language Archive". Archived from the original on 2013-11-02. ^ D'Orso, Michael (2007). Eagle Blue: A Team, a Tribe, and a High School Basketball Season in Arctic Alaska. Bloomsbury Publishing USA. p. 93. ISBN 978-1-59691-115-4. ^ "Alaska State Almanac - General information about Alaska from NETSTATE.COM". Archived from the original on 7 May 2016. Retrieved 22 April 2016. ^ "1897 - Yukon Nuggets - Yukon History". Archived from the original on 2011-10-07. ^ "Fort Yukon" Archived 2008-12-02 at the Wayback Machine. Encyclopedia Astronautica. astronautix.com. Retrieved 12 January 2012. ^ "NOAA Weather Radio All Hazards Information - Alaska Weather Interesting Facts and Records" (PDF). National Oceanic and Atmospheric Administration. Archived from the original (PDF) on 2006-09-29. Retrieved 2007-01-03. ^ "State Extremes". Western Regional Climate Center, Desert Research Institute. Archived from the original on 2011-05-17. Retrieved 2007-01-03. ^ Day, Preston C. "Extreme Cold in the Yukon Region : The Cold Winter of 1917–18". Monthly Weather Review. 46 (12): 571–572. ^ Fort Yukon, Alaska - Period of Record : 1/1/1899 to 3/31/1990 Archived 2016-04-26 at the Wayback Machine. Retrieved August 7, 2016. ^ " Mailing Addresses and Contact Information Archived 2016-12-20 at the Wayback Machine." Yukon Flats School District. Retrieved on December 4, 2016.